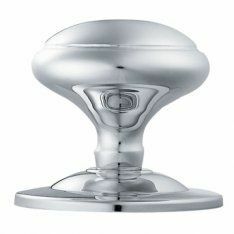 Centre door knobs are both practical and stylish. These knobs work as a fixed pull to help to close the door from the outside and also work as a decorative feature for your entrance door. Our centre door knobs come in a variety of designs and colours to fit your personal style, including modern and simple designs such as our brass centre door knob or more unique knobs, such as the hand forged octagonal centre door knob crafted by From the Anvil. In case you don’t require a doorknob, but still want a pull to aid closing your front door, we would recommend our simple and useful door cylinder pulls. In addition to these, we also supply a wide collection of door handles perfect for entrance doors. To further embellish your front door, our door knockers, letter plates, and door numerals are the ideal products to give your door a unique look. We stock the traditional and very popular lion’s head door knocker in black, brass and pewter. This door knocker represents strength, bravery, nobility and valour. If you are simply looking for improving your door’s security, we would recommend having a scroll through our selection of door locks. Sash locks are the ideal door lock for your entrance door as these locks feature both a deadbolt and a latch. For a secondary locking mechanism, both mortice deadlocks and rim latches are perfect locks for the job. Door chains and door peephole viewers can also be installed for added security.